Staff photo by Dan Henry/Chattanooga Times Free Press - November 12, 2010. 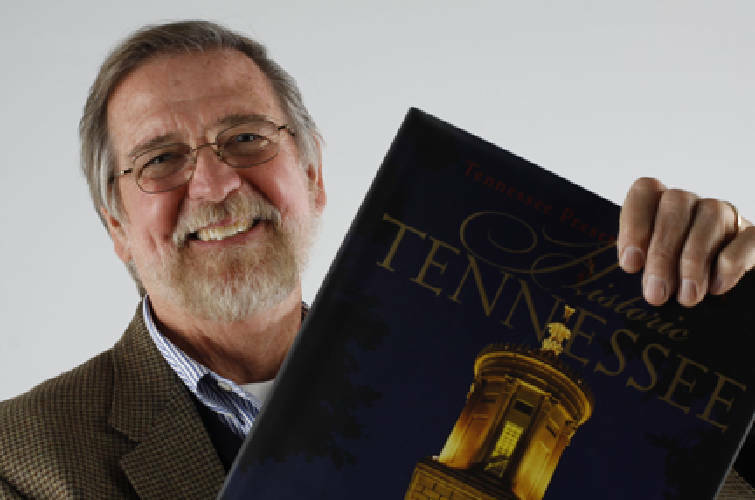 Robin Hood, a Pulitzer prize winning photographer, poses with his new book "Historic Tennessee". Proceeds from the sale of the book will benefit the Tennessee Preservation Trust. Hood worked for the Chattanooga Free Press from 1971-1979. Robin Hood is back in town. The former Chattanooga News-Free Press photographer, who won a Pulitzer Prize in 1977 for his photo of a Vietnam War soldier watching the Chattanooga Armed Forces Day parade, is visiting to mark the publication of a new book. "Historic Tennessee" features his photographs and writer Jim Crutchfield's text about historic sites in the state. Proceeds from book sales benefit the Tennessee Preservation Trust. The public is invited to a book signing, reception, video presentation and talk from 5:30 to 7:30 tonight at the Tivoli Theatre in downtown Chattanooga. Admission is free. The event, sponsored by Cornerstones, Chattanooga's historic preservation group, will begin with a reception in the lobby of the Tivoli, where guests can meet Hood and Crutchfield. Copies of the $50 coffee-table book will be available for purchase. Cornerstone board member Becky Browder called Hood, who now lives in Nashville, a "hometown hero." The large-scale book includes more than 300 color photographs of 90 sites key to Tennessee's historic and architectural history, according to a news release. Hood said this is the latest of seven books featuring his photography. "I had never seen a book that features a collection of photos of historic sites," he said. "These sites are important to Tennessee history. The sites are treasures we take for granted, and we don't know most of the back stories of these sites." Most people don't know, for example, that the Tennessee State Capitol is the second oldest capitol building in the country, Hood said. The building also houses the tomb of its architect, William Strickland, and is the burial site of U.S. President James K. Polk and his wife. "Women's right to vote was ratified in the halls of that building," Hood said. "When you learn that it's more than a building, it becomes history." The book makes people aware of the importance of historical preservation, Hood said. "The buildings I photographed are not just old buildings. They're gems that belong to us," he said. "As citizens of Tennessee, it's up to us to preserve this history for our children and grandchildren." For nearly a year, Hood said, he traveled across the state, sometimes going to the same sites three times to get the perfect shot. Sometimes, he added, he just happened to be in the right place at the right time. At tonight's event, guests will view an original 15-minute documentary by WTCI showcasing images from the book, Browder said. Afterward, host Tom Griscom, the former executive editor and publisher of the Times Free Press, will moderate a discussion about the book with Hood and Crutchfield.